The well-known, proven performance of the Golden Saber line by Remington is a perk for those who want to have great value out of their personal defense load choices. This happens to be the original Golden Saber loadout that features a 180 grain jacketed hollow point projectile and was the catalyst for so many competitors due to the shining reviews and excellent terminal ballistic performance of the load. 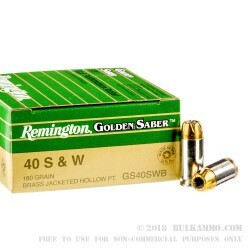 Remington isn’t the only one who is aware of the performance of the storied line of ammunition under the Golden Saber label. Competitors everywhere have tried to outdo the load for many years and it still performs with the best of them on gelatin tests and in practical real-world tests, that include reliability in feeding; ignition and extraction. 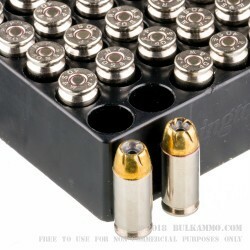 Extraction and feeding is helped by the reloadable Boxer primed Nickel plated casing. 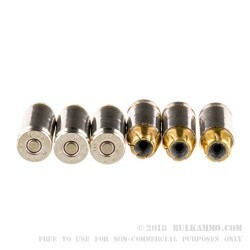 The rounded nose of the hollow point projectile also improves feeding issues that most hollow points have inherently in certain guns. The Golden Saber line works well in all mainstream firearms. An impressive 1015 feet per second velocity and 412 ft. lbs. of energy offer performance that still is hard to match even by the most technologically advanced engineered loads.